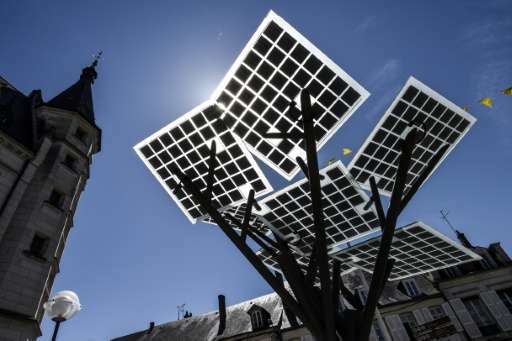 A solar tree with giant square leaves that convert sunlight into electricity was unveiled in the central French town of Nevers on Monday, allowing passers-by to charge their phones, surf the internet... or just enjoy the shade. The town of 37,000 on the Loire river is the first in Europe to experiment with the technology developed by Israeli company Sol-logic. Inspired by the acacia tree found in the Israeli desert and African savanna, the futuristic-looking "eTree" also supplies water and street lighting. The first prototype was unveiled in Israel in 2014. A year later the first operational model was presented at the COP 21 climate conference in Paris. Since then solar trees have been planted in around 10 cities in Israel and the US. Government funded projects are really sad! Even true solar farms do not produce power at competitive prices let alone something surrounded by buildings in the middle of a city. If this were powering say a sensor or emergency communications in a remote location that does not have power it would make a lot of sense. MR166: What a Trumpesque way of looking at the world you have. That is something truly sad. Government funded projects are really sad! Get off the internet, then. Go back to living in a cave. Sheesh. Do you know that almost everything you use in daily life (from roads to electricity to water to waste disposal to ... ) wouldn't exist if it wasn't for government funding to set it up, help it along and keep it running? Solar is economically viable in sunny states, especially when you remove the government funded subsidies from oil and coal. I once heard a radio add about a southern lady using the 'OnStar' service provided in cars that had just unlocked the keys she had locked in her car. She then stated that the government should continue to fund services like this instead of NASA (OnStar is a private company). Her ignorance of how NASA helped to make the unlocking of her car possible was laughable. "Even true solar farms do not produce power at competitive prices let alone something surrounded by buildings in the middle of a city." Nobody can beat the cost of solar now. My own cost $12,400 and paid back $3000 last year, powering both house and EV. Since then, both electricity and gasoline have gone up, so the savings will be higher. Placebos grow on trees, fertilized with taxpayers' hard-earned money. Eco-nuts and faux-greens want to impose solar placebos in an already decarbonized economy to bring back more fossil fuels as happened in Germany and is happening in Switzerland. Ya know, maybe they should plant a real tree and put the PV back up on the roof where it belongs?